We offer Vertical Turning Lathe Machine. 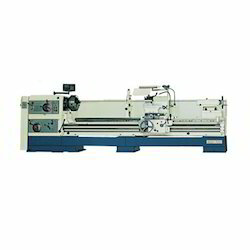 Lathe Machines with all sizes are available in best quality. Length Of Bed: 1375 mm / 4'-6"
Height of Centre: 190 mm / 7.5"
Swing Over Cross Slide: 180 mm / 7"
Bed Width: 241 mm / 9.5"
Swing Over Bed: 355 mm / 14"
In production we use all kinds of machines like lathe machine, heavy duty lathe machine, extra heavy lathe machine and many others. Lathe machines have a long life that is quite rare in the market. - Max Bar Capacity 2"
- Distance between Centers 20"
- Max Cutting Diameter 10"
We are offering light duty lathe machine to our valuable clients. These light duty lathe machine are widely known for its durability and quality. Our light duty lathe machine can be availed at industrial leading price.